A man goes skydiving for the first time. After listening to the instructor for what seems like days, he is ready to go. 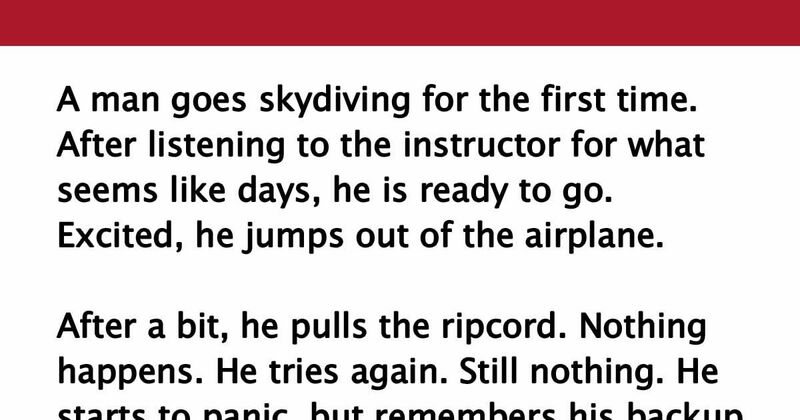 Excited, he jumps out of the airplane. He frantically begins pulling both cords, but to no avail. Suddenly, he looks down and he can't believe his eyes. Another man is in the air with him, but this guy is going up. Just as the other guy passes by, the skydiver – by this time scared out of his wits – yells, "Hey, do you know anything about skydiving?" The other guy yells back, "No! Do you know anything about gas stoves?" Ouch! Like and Share this one if you laughed at it!